Like everything we build at ETS, our HoneyWarrior was born through a love for the land, a desire for progress, and a drive for precise nutrient application. In this case the nutrient taking center stage is good, old-fashioned manure. The HoneyWarrior got its start in 2006 when ETS founder and farmer, Mark Bauer, wanted to utilize hog manure in his strip-till operation. Bauer had previously designed and patented the innovative SoilWarrior X row unit, which was the first of its kind to provide coulter-only vertical tillage. Eventually, the SoilWarrior grew into a complete strip-till system that included the capability to apply dry and liquid fertilizer. The last piece of the puzzle was making the system work for farmers who wanted to apply liquid manure. So Bauer attached six SoilWarrior N row units to an ETS toolbar and mounted it to the back of his manure tank. The resulting system could incorporate a low rate of nutrients at a good speed. It may not have been the most beautiful machine running through the field that first day, but it sure worked beautifully. Farmers began taking note and placing orders. In 2009 the HoneyWarrior evolved into a more sophisticated and accurate system, thanks to a partnership with Puck Custom Enterprises (PCE). PCE is in the business of custom application and had clients interested in applying higher gallons per minute, in heavy residue, without changing their minimal tillage practices. Combining the ETS row units, toolbar, and cart with PCE’s patented tractor mounted 4WD swing pipe and distribution system turned out to be a great match. That first complete system was 30 feet wide and applied up to 20,000 gallons per acre at speeds of up to 6 miles per hour. Today, the HoneyWarrior is available in widths up to 50 feet and is capable of handling flow rates up to 3,500 gpm. It is considered the most adaptable and accurate manure application tool on the market and serves as a great example of how an innovative partnership can help deliver precision and profits to farmers. The HoneyWarrior can be purchased as a complete system, which includes row units, toolbar, HD cart, distribution manifold, and swing pipe assembly. ETS also offers row units and toolbar that mount to a Houle or Nuhn manure tank. X and N row units are the toughest and most versatile in the industry. They can provide up to 12 inches of deep tillage, 6 inches of shallow tillage, cut through heavy field residue, and can handle high levels of residue. The N row unit also allows you to attach a shank/knife if your soil requires it. The row units attach to a heavy duty 4500 series toolbar with active wing down pressure (on most models). 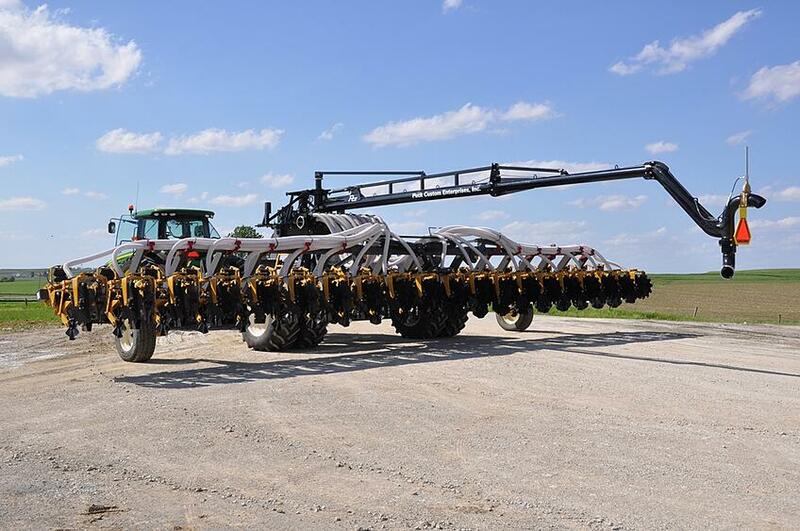 It can accommodate row unit configurations up to 20 rows of the SN and 20, 22, or 30-inch row spacing. Toolbars can be manufactured in widths of 30, 40, and 50 feet. The 4550 model can accomodate 30, 40, or 50 feet to match your application needs. Apply low and high rates in the same unit. The HD and XL Carts support high acre, high gallon, and high speed application. They have the largest tires in the industry. The HD Carts are available with 540/65R30 R1. The XL is equipped with four monstrous IP600/75R30 R1 tires and AD2 technology to help reduce compaction. All carts have duals standard. Oil bath hubs are standard on the row units with two grease points per row on the SN. This reduces maintenance and service. The PCE fluid delivery, swing pipe, and distribution system can handle flow rates up to 3,500 gallons per minute. The Tube Distributor provides excellent flow with no moving parts. The PCE Swing Pipe has a hydraulic cylinder dampener for better control and easy turning. A Krohne 8-inch electromagnetic flow meter completes the package for highly accurate measurement.